Netgear has been a dominant player in the gaming router market. Nearly routers on the market follow similar technical standards. 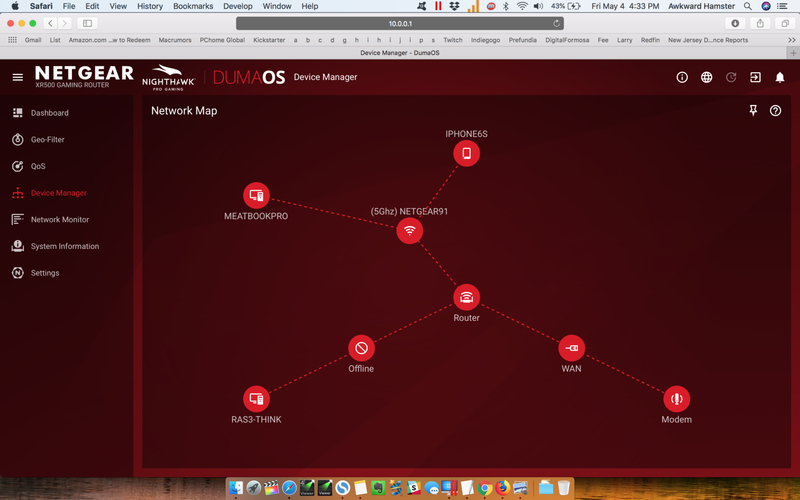 What sets the Netgear Nighthawk XR500 apart is it is powered by NetDuma DumaOS. This combination provides a easy to use, yet powerful, interface to manager our Nighthawk for gaming and streaming. The technical specs are nearly identical the Nighthawk X4S. The key difference being the XR500 does not have an eSata port. The Nighthawk XR500 maintains the slim design its predecessors with a edgier look. The matte black outer shell doesn't scream for attention like their colorful competition and blends in nicely with any room whether it sits on a desk or shelf. To go even more low key, you can turn off all LEDs except for the power LED with a flip of a switch. features, and ReadySHARE just to name a few. Both apps are free so we would recommend first going with Netgear Genie. The full array of advanced functionality and features can only be access using the web interface. We livestream on Twitch every Friday. 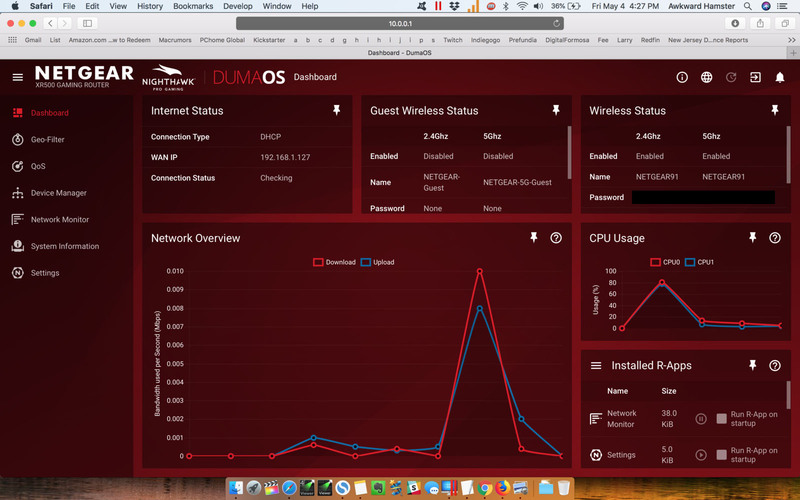 To ensure we have priority on the bandwidth, we adjusted the QoS to give priority to our gaming console and PC. For home use, I can prioritize video services like Hulu so viewers can watch shows without choppiness or lag. With two USB 3.0 ports, we can connect two high speed storage units to the XR500 or have one USB for the printer and the other for the portable hard drive. 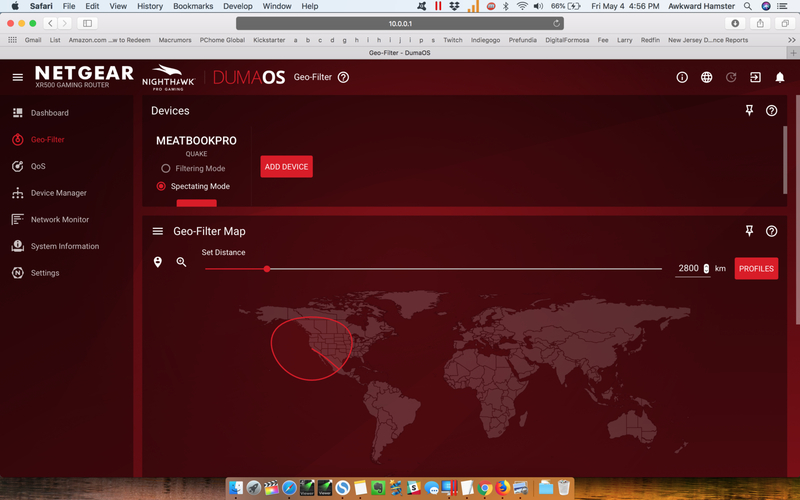 Gamers who host their own server would come to appreciate DumaOS's Geo-Filter feature. There are times when we just want to game with others on the same continent. This helps reduce load time, latency, lag, just to name a few. With Geo-Filter, we can specify who can connect to our Quake server. Geo-Filter is only available for some of the more popular games. 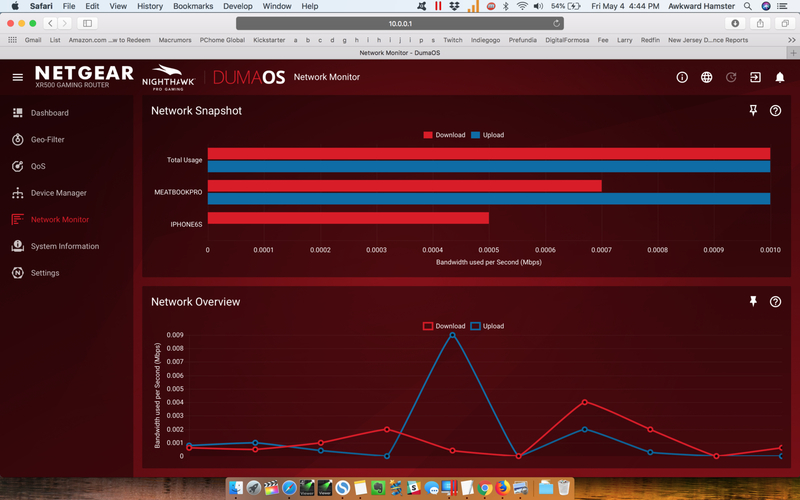 Adjusting Quality of Service (QoS)is very simple with DumaOS's graphical interface. We select our device on what looks like a color wheel and give it higher priority. We can also select the device name and manually enter the desired distribution and bandwidth. 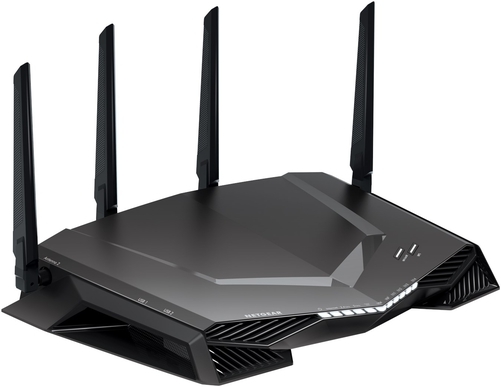 The Netgear Nighthawk XR500 comes with one of the highest-specs that are available in the market. With a quoted bandwidth of AC2600, we have the power to transfer data at 1,733Mbps from its 5GHz band. The 800Mbps version is also very impressive with its 2.4GHz band. In our tests under various conditions at our office. The main floor of our office is roughly 3,000 soft. In the same room as the router, 10 active file transfers to an external FTP Server topped 2.8MB/second per connection on the 5GHz band. Transfer speeds on 2.4GHz were roughly 20% slower. When we moved two rooms away from the router, we found the 2.4GHz band performed about the same as the 5GHz band. As Twitch Partners, we have to ensure our livestreams go off without a hitch. Having an easy to access physical button to shut off WiFi turned out to be more useful than anticipated. There are two possible locations for streamers. We can either stream from a controlled environment such as the office or home, or, we stream at a venue. While in the office, we do not have to worry about signal interference. But at trade shows, such CES or PAX, WiFi is very unreliable. At any given moment, there are dozens of exhibitors in the immediate vicinity with their own wireless access points and hotspots. All this interference reduces our WiFi speed and range. We would keep our streaming equipment connected to the XR500 using the gigabit Ethernet port and keep nonessential devices like smartphones and laptops connected to the WiFi. Once we are ready to stream, we simply press the WiFi button to disable WiFi and preserve all the bandwidth to the hardwired devices. 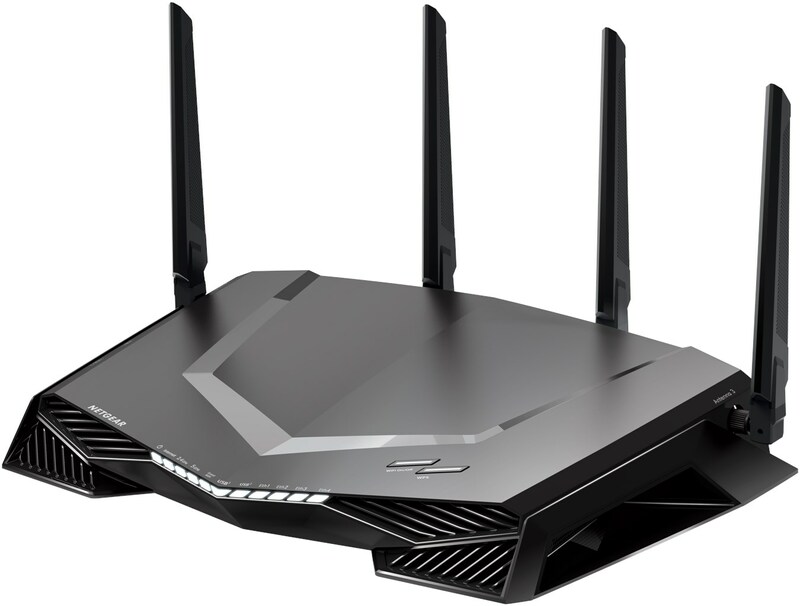 NETGEAR Nighthawk XR500 Pro Gaming router shines above the competition thanks to the impressive tech powered by DumaOS. It is one of the most fully loaded and the fastest router we have seen. From the perspective of gamers and Twitch streamers, the Nighthawk XR500 would be at the top of any list. If your budget is tight, the Nighthawk X4S offers great value with similar specs.